An elegant ladies' watch from Accurist. Crafted from radiant rose gold plated stainless steel, this timepiece has a crisp white dial with date window and mesh style strap. Delicate and feminine, the perfect accessory for a stylish transition from day to night. 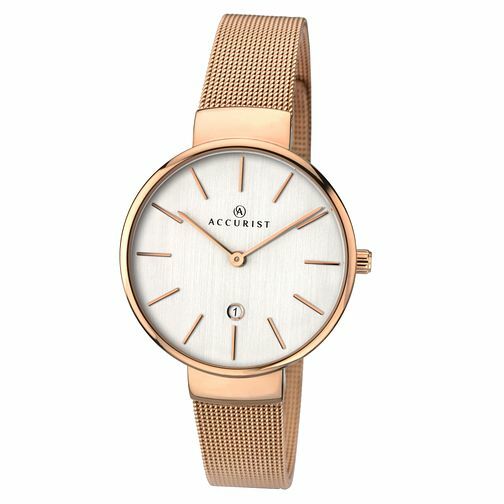 Accurist Ladies' Rose Gold Plated Mesh Bracelet Watch is rated 5.0 out of 5 by 4. Rated 5 out of 5 by Anonymous from Simple and elegant watch Simple and elegant watch, good build quality. The mesh bracelet is very easy to adjust. Delivery was on time. Very happy with my purchase and price.